1.4 16 channel setup: Main board + Daisy module. DISCLAIMER: Use these instructions on your own risk. It is critical to understand that the devices and methods presented here are in no means a safe and tested setup and they do not adhere to medical standards! Keep all devices only running on batteries and NEVER attach them to living things like humans without making 100% sure they are disconnected (COMPLETELY) from the power grid/plug/line etc.! Also make sure that no bare wires or electordes can get in contact with the head-attached device or electrodes and make sure the power connectors (from battery) are fixed and do not get in connected with the electrodes on the head. Room, there is always “free” room somewhere you can sleep, especially overnight. 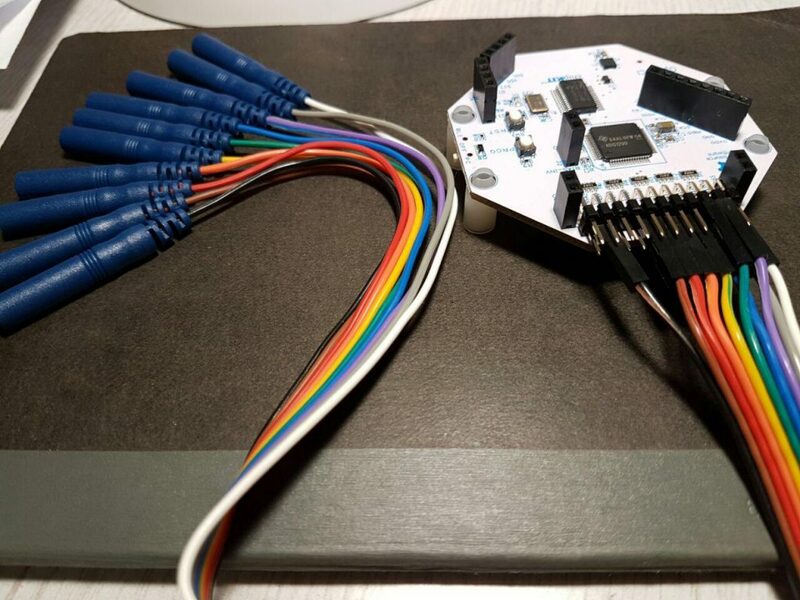 http://pirate.info/producten/open-source-hardware/openBCI (also for self assembly, it is about $250 if you assemble the 16-channel version (with daisy module) yourself with all parts included, most expensive part is the ADS1299 chip each around $50-60). + recording is with 24 bit signal precision. In reality the signal resolution is up to 0.02235 microVolts at 24x gain (default, see Table 1 below). They are stored as 6 hex values (= 24 bit) on the SD card and. Usually 0.1 microVolts is more than enough for EEG and ECG and EMG etc. and noise is anyway about (0.16 microVolts root-mean-squared, recording the same channel deviation C3:A2 directly or rereferenced gave a noise of about +-0.6µV, that is awesome!). The signal range is more than sufficient at any gain value. – no trigger out of the box (so no lights-off moment) – however will be possible with newer Firmware soon, and you can use a channel to take a kind of trigger signal (no problem with rasperry pi hardware et al. running on batteries, or your laptop running on batteries and not being pluged in for charging). However see simple Trigger builtbelow. 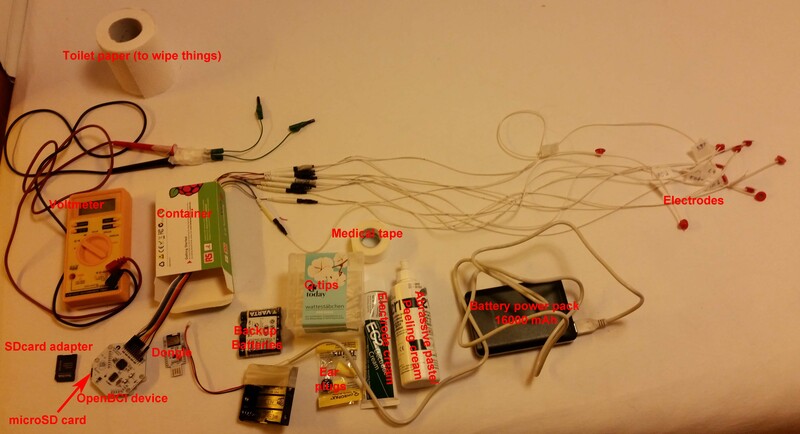 Here is a setup example for a sleep recording for the pins on the OpenBCI device. The setup is a standard sleep polysomnography setup usable for sleep scoring based on Rechtschaffen and Kales (1968). It includes and EOG (two bipolar electrodes around the eyes) and EMG (two bipolar electrodes on the chin, musculus mentalis) and two EEG Deviations at C3 and C4 according to the international 10-20 Electrode placement system (that is C3:A2, C4:A1). The setup records C3, C3, A1 (left mastoid) and A2 (right mastoid) signals separatly referenced to a placed reference electrode at Cz and uses as a bias Bias/Ground electrode at Fpz (placed at the center of the forehead). Other than in the original description the A1 and A1 should not be placed on the ear lobues, but on the Mastoids (the “bony”, part behind each ear). This way, one can later also deal with lost mastoid electrodes (e.g. in case A2 is lost one can still use C3:A1 as a backup) and this setup is in general more flexible, thus preferred here. * Importantly, in this configuration all the (non-biploar) channels that are referenced to the SRB2 (N, bottom) pin (that is the EEG channels like A1, A2, C3, C4) are REVERSED in their polarity. This can only be corrected later on after the converstion (non-“.csv” files like edf or brainvision files). This is not avoidable, otherwise one needs to reference against the SRB1 pin (P, TOP), which however will FORCE all channels to be referenced to this channels, thus not allowing for bipolar channels like EMG and EOG. So this setup is clearly preferred. The polaritiy of the bipolar channels are not impaired by this. Any standard EEG electrodes will do, however best are Silver/SilcerChloride electrodes for such sleep recordings, but any other will do fine. For electrode paste, I have good experience with “Grass EC2 Electrode Cream” which is a commercially available paste that keeps the electrodes fixed to the head, and the impendances low over the whole night, also it washes off quite well with just warm water. In brief, to place an electrode, use a Q-tip and some abbrasive (peeling) cream (< $2 in store) to scratch of your skin a little in an 1cm² region, wipe of with skin desinfectant (to get rid of any residues on skin) and aply the heavily creamed electrode to the site, fix with two finger-long medical bandage stripes of tape in a criss-crossed way (do not use medical tape that is hard to remove from hair or skin, and that does soften on warm water). Check your impendances (using a standard Voltmeter/Impendance measure device from the hardware store for < $10) between any two EEG eletrode pairs are < 5 kOhm (e.g. measuring ground electrode vs reference electrode, then reference against all the others) EMG and EOG electrodes < 10 kOhm is OK.
After use, carefully clean your electrodes and head with water, a very wet and warm towel on your head in the morning for 3-5 min will help you remove the electrodes in no time without any hair loss. USE COsleep, see here and save your time in installing and setting up the OpenBCI_GUI, all you need is a running Ubuntu 18.04 LTS which can be installed in parallel on most systems in a few minutes, or even can be run from an USB stick directly without the need to alter anything on your PC. Prepare connections and setup electrodes and OpenBCI device (see section above on Hardware setup for this). Prepare the microSD card for new recording, this means delete/backup/save previous files on there (if not formated in FAT32 then http://docs.openbci.com/tutorials/10-OpenBCI_on_Windowsdo so now, see SD card basics for how to do so, it is important that the SD card is formated correctly, otherwise the data will not write properly (e.g. SDFormater 4.0 Option: “FULL(OverWrite) FORMAT, FORMAT ADJUSTMENT OFF”), SD cards of “Class 4” seems to be sufficient although “Class 10” is recommended), it does not seem to matter if other (non-OpenBCI) files are on the card once it was formatted, an microSD to SD adapter for your PC and a SD card reader is required of course for this). Check if the dongle switch is turned on “GPIO_6” NOT “RESET”. Put in the microSD card in the OpenBCI device. Plug in dongle first (until blue light is on), if it is plugged in plug it out and then in again. Turn on OpenBCI device, that is put the switch on “PC” NOT “BLE” (ideally you should see one or two very short red blinks on the OpenBCI dongle after the OpenBCI device was turned on, this is a good sign, but does not have to occur), if you have a trigger cable also check if it is connected and plugged to the power. Start the OpenBCI_HUB and then the OpenBCI_GUI (prefereably in the Processing version or a new exported version of it, get it here https://github.com/OpenBCI/OpenBCI_Processing or use one of the newer compiled versions http://openbci.com/index.php/downloads e.g. version 3.3.1, Windows and Mac version work nicely). Edit all your channels (click “Hardware settings” in the top left for this) for the recording to follow (all with gain of 24, this also works fine for the sleep EMG), see the Tables below for the setup. Wait until you have recorded your sleep etc. to be written on a your file (e.g. “OBCI_0C.TXT”) to be written to the SD card. Then edit the “obci_convert_gain24_constant_trigger.bat” in that folder for the SpiSOP toolbox folder and give correct paths to the toolbox, and run it, wait a little and you have your converted files! to fit your SpiSOP folder path. You can use these converted files to do sleep scoring with the SpiSOP browser function, and do other cool stuff with your sleep EEG with other SpiSOP functions. Now you can feel like a sleep resercher and detect your own sleep! You need a second connector cable with 10 additional electrodes. For example you can remove the black and white cable from this connector resulting in 8 additional EEG channels, … removing them avoids confusion them with the Reference (white, connected with a Y cable/bridge) and Ground (black) of the first connector the of the setup below. But you can also use these two extra cables for an ECG. Conversion of the 16 channels (and also backwards compatible with 8 channels): replace the SD_to_ascii_then_to_EEG with the SD_to_ascii_then_to_EEG_16_channel found in this zip and look at the examples given there. The power consumption of the 32bit/Cyton 8 channel device is (as measured by my standard Voltmeter) about ~50 mA in idle mode, ~65 mA in connected mode, and ~75 mA while streaming and recording on SD card. So a 16000 mA 5 V USB power pack can last fully charged (in principle) for up to 8 days through. To prevent (yourself and) others to charge the power pack while connected with your OpenBCI: TAPE THE PLUG AS TO NOT MAKE YOUR POWER PACK CHARGEABLE WHILE USING IT AS A POWER SOURCE FOR A DEVICE CONNECTED TO YOUR HEAD! Solution 1 (Quick): Turn on the LED flashlight while powering the OpenBCI device (and cover the flashlight with some opaque tape to make it not shine all night). This draws a lot of power though. Solution2 (better): bridge the power source with a 100 Ohm resistor. USE A RESISTOR THAT CAN WITHSTAND 1 W OF POWER (most resistors are not built for this I would recommend using metal film resistors, NOT carbon film resistors), otherwise the resistor (and things near it) will get very hot (or burned)! This resistor will pull ~50 mA from the 5 V battery pack when turned on. This is enough to keep your device running (ONLY) if your OpenBCI device is powered. If the device is not turned on, then (magically) the power pack shuts down automatically after a few seconds. The resulting power consumption is 72 mA + 50 mA = 122 mA (still not much as you can power your device about 5 days straight with one charge of the recommended power pack). Solution3 (best): get a power pack that does not power down on low power draws. e.g. https://www.ravpower.de/12000mah-portable-charger-black.html or the 22000 mAh version, Model RP-PB052, from https://www.ravpower.com/portable-charger.html which I tested to not shut down on low power draw and idle OpenBCI device, it thus will theoretically last to power the device for 12 days! A short test on an 8-hour recording at usual Central European room temperatures (22° C) lead to the conclusion that the sample rate was overall (on average) faster than the 250 Hz (that is about 250.4 Hz) leading to approximately a 1 minute extra of displayed recording time in an 8 h of recording when it was in fact shorter. In conclusion the sampling rate varies over the recording, It is unclear how much it varies within this time frame and how stable the sampling rate is over longer terms (that is, is it 250.4 Hz all the time or not? This needs still to be determined). It is also unclear how this changes from device to device. This altering sampling rate makes sense when one consideres that there was no external oscillator (clock) used on the board. You can record with several devices at the same time. Each device than has to share the same bias and reference electrodes via a bridged, and also share one additional channel (e.g. EEG) via a bridge. Later the signals from the many devices can be concatenated using signal coherence of the shared EEG channel (via cross-correlation with the lag of the peak in correlation value as an adjustment). Feasible are at least 4 devices each with 16 channels, that is including EMG, ECG and EOG (3 channels) in one device and one shared channel for the others = (16-3) + (16-1) + (16-1) + (16-1) = 58 EEG at 125 Hz (and potentially more when the Wifi shield is out)…. for a device around $4000. You just start recording of those devices one after the other on SD card… later concatenate the signals after the recording is finished. This makes it unfeasible now to monitor all channels live on the same PC (however could be achieved by running several instaces of the OpenBCI GUI, and plugging in all the dongles at the same time). Imporantly, if you merge the data later you need to consider that the sampling rates of each device was not synched! This leads to time uncertainty in each channel and limits the use of the concatenated data, that is you cannot use it for timelocked analysis accross channels of different devices (e.g. slow waves in channel 1 recorded with device 1 timelocked to spindles in channel 11 recorded with device 2. However it should be fine for counting spindles or spindle density/slow wave density, or do channel-wise analyses. Any (non-metal inside) box will do that can hold battery and device at the same time and maybe can be carried around. You can shield it further with Aluminum around the case. And nothing keeps you from stuffing it in a nice teddy bear to go to sleep or send others to sleep with. It is however highly recommended to isolate the device first in some thicker plastic before rapping it in something conductive (e.g. non-conductive tape) and keeping it away from sharp things that could demage the contacts or the board circuits (e.g. a dry kitchen sponge)! You can also consider to Plastidip it or put some hot glue around any open contacts and wires that might get short circuited. Connection of dongle and device cannot be established and the dongle LED is blinking red shortly a few time but then breaks off. If in this case it works (after shutting down the device, reconnect the dongle, turn on device again) to connect WITHOUT SD card (and initialization of it) then your SD card is probably formatted wrong or full or not compbatible. Follow the instructions at the OpenBCI website here.